The famed Shenandoah Valley stretches from the Eastern Panhandle of West Virginia south to Roanoke, Virginia. Visitors are charmed by the valley’s unique culture; a region dotted with vibrant and historic towns and villages, rich history, friendly communities, beautiful scenery, and incredible recreational opportunities. 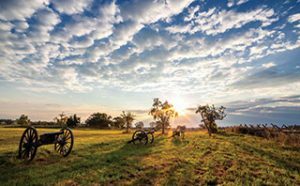 Set up your “base camp” in Winchester-Frederick County. From hotels to B&Bs, home rentals, RV and tent camping, there are numerous lodging options.Depending on your interests, use the below links to choose several activities for the day. Popular choices include the Patsy Cline Historic House, Civil War battlefields, Museum of the Shenandoah Valley, and wineries and farm markets. Old Town Winchester is a must-see hotspot. 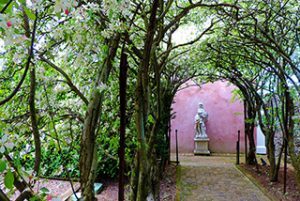 It’s a great place to stroll, enjoy a meal at an outdoor café, do some shopping, take a self-guided history tour, and so much more. 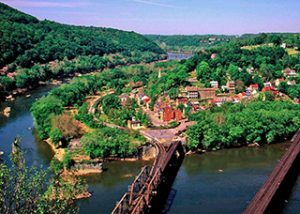 Just a short 45 minute drive from Winchester is Harpers Ferry, located at the confluence of the Potomac and Shenandoah Rivers. Thomas Jefferson once referred to the area as “…perhaps one of the most stupendous scenes in nature.” This beautiful and well-known 19th century living history village is also a National Historical Park. Ranger-guided historical tours are included in the park’s entrance fees. Outdoor lovers can explore hiking trails, zip-line tours, and white-water rafting. 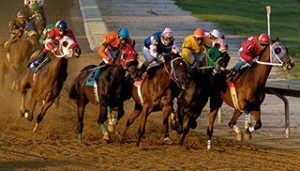 After visiting Harper’s Ferry, prepare to live it up at the nearby Hollywood Casino at Charles Town races. Experience the thrill of live thoroughbred horse racing, gamble the night away at the casino slots and table games, or see a comedy show or a performance by a nationally known artist in the event center. Return to the Winchester area for the night. Eat breakfast in Winchester and pack a picnic lunch before departing for Shenandoah National Park. Drive from Winchester to the North Entrance Station at Front Royal. 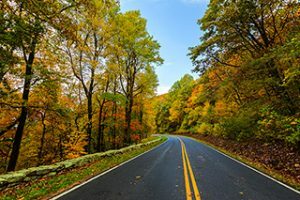 Enjoy a leisurely scenic drive on the famed Skyline Drive, with more than 75 overlooks and views of the famed Shenandoah Valley. The park boasts more than 500 miles of hiking trails with stunning views, waterfalls, wildlife and incredible “leaf peeping” in the fall. Continue south to the Thornton Gap Entrance Station, where you can exit the park and take Rt. 211 West to Luray. 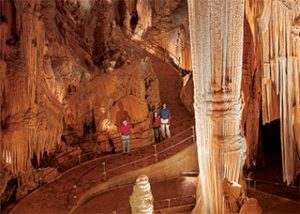 In Luray, take a one-hour tour of the largest and most popular caverns on the East Coast, Luray Caverns. Stand in wonder as you take in the cathedral-sized rooms and geological wonders of the Great Stalacpipe Organ and Dream Lake, all formed underground by a slow dripping of mineral-rich water on limestone. Travel back to Winchester via scenic Route 340 and Route 522, or take Interstate 81 for a quicker route. Enjoy dinner in Winchester at one of our 200+ restaurants and return to your lodging for the final night.